I just realized it’s been awfully long since I posted pictures of the jewelry I’ve been beading, so let’s remedy that, shall we? If you’re not into beads or jewelry or creativity, that’s okay. We don’t all have the same interests. You can skip reading right now. Just don’t leave forever, ‘k? Come back and join us next time, when I’m not writing about beads! Still here? Great — thanks, and let’s get right to it. 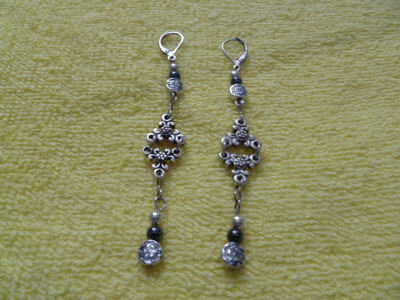 2) These silver-plated earrings dangle about 3.5 inches from a leverback closure. They feature antique silver beads, hematite beads (a grounding stone), and silver ball spacers. 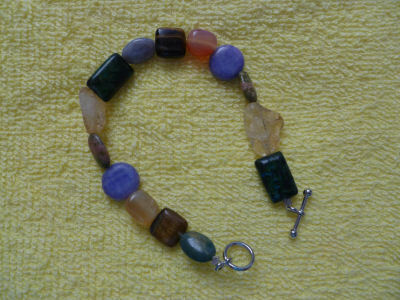 3) This is another healing bracelet. 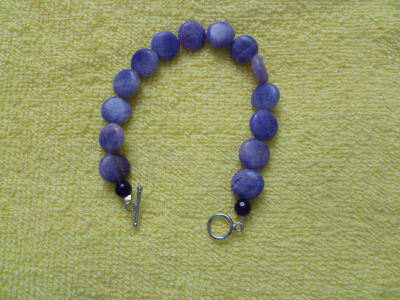 It is made up of 14 disc-shaped blue lace agate beads and two 6mm round amethyst beads. Blue lace agate counteracts the fear of rejection, making it a perfect stone for writers! In addition, it instills peace of mind. Who doesn’t want that?? Amethyst helps with focus, balances highs and lows, and enhances memory. 4) This is a pair of chandelier earrings, approximately 3 inches in length with a fish hook earring wire. The heart-shaped chandelier portion adds a feminine, delicate touch in silver. The stones are white faux pearls, clear crystals, and light- and medium-colored sapphire crystal bicones. 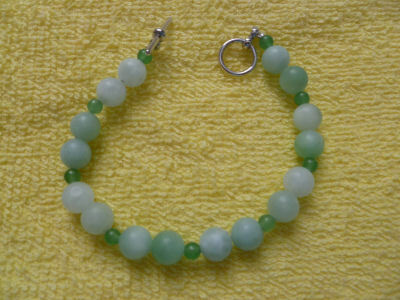 5) This healing bracelet is made up of 16, 8mm round Amazonite beads (the pale green ones) spaced with 9, 4mm round green Aventurine beads. Amazonite helps you see both sides of an argument, creates emotional balance, and is an excellent filtering stone. It’s of particular benefit to musicians and writers. There are lots of Websites that list the properties of semiprecious stones. My information comes from July Hall’s The Encyclopedia of Crystals. Did I use any of your favorite gemstones this time? This entry was posted in Beaded Jewelry and tagged amazonite, aventurine, beaded jewelry, blue lace agate, bracelets, carnelian, chandelier earrings, citrine, crystals, healing bracelets, Hematite, howlite, jade, jasper, mookaite, tiger's eye, unakite. Bookmark the permalink. Amazonite’s a new one – I’ve never heard of it. But it surely is pretty! Along with the silver earrings, it’s my favorite of this group. I always enjoy seeing your work – I didn’t realize I’d missed it until you posted these photos. I’ll confess it. The so-called healing properties of specific stones seems silly to me. Maybe I’m just not enlightened or sensitive enough to “get it”. On the other hand, there’s no question that when I’m wearing something I think beautiful, I feel better because of it. I’ll bet that counts! Linda, your words are music to my ears! I’m glad you’re not bored with seeing pictures and reading descriptions of my beaded creations. I fell in love with Amazonite when I first saw it! It’s in the feldspar family and gets its greenish color from the copper content. It’s the astrological gemstone for Virgos (like me), and it’s primarily found in India. Debbie, I LOVE when you post about your jewelry! And what beautiful jewelry it is. Your bead work is just lovely. And I like how you listed the properties of each gemstone. As you know, I truly believe in the healing properties of gemstones because they contain energy from the earth. I used to use them a lot during my Reiki sessions and could feel the magnification of energy from the stones. What beautiful colors in that first healing bracelet! Thank you for sharing your passion and talent! Have a FAB Saturday! Ah, Ron, thank you for your healing words! I’m still a bit intimidated at putting my work out there, especially when there’s so much beautiful jewelry-making, but I’m glad that mine gives people pleasure, too. I remember that you did Reiki sessions, and I hope you’ll post more about that some day (if you have, it was before I became acquainted with your blog). It fascinates me that people can use what many think of as inanimate objects and secure healing. Thanks for stopping by, and have a splendid weekend! So pretty! Naturally, I love the chandelier earrings with the hearts! The blue lace agate is also very pretty. Love knowing about each of the stones! Katybeth, I’m humbled that you like my post (and my beadwork). Those chandeliers are surprisingly light in weight, making them perfect for everyday occasions, not just dressy ones. And it’s funny about the blue lace agate bracelet. The stones in real life are more of a lavender, whereas the photo looks more blue. Wonder why that is?? Thanks for dropping in — hope your boy will be back home soon! 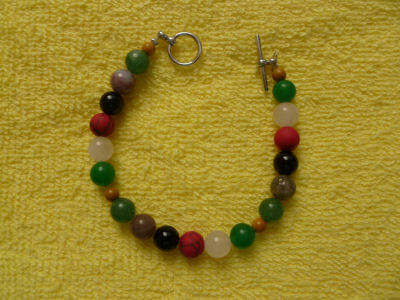 I love the bracelet, Debbie – like a chakra inspired color and energy source. You do such beautiful work and love it when you share photos of it. Barb, you’re making me blush — thank you for indulging one of my passions. I love the feel and look of these gemstones. Working with them speaks to me on a deep level. I’m glad to hear you enjoy looking at them, too! Sapphire is my birth stone, Debbie. 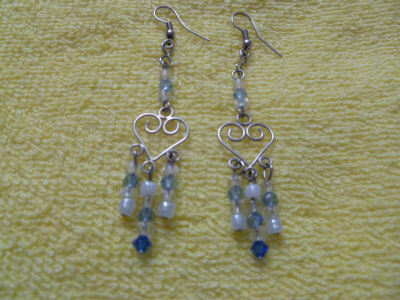 I love the sapphire chandelier earrings. Lovely, indeed! Sapphire is my birthstone, too! I’m so glad you like them, Monica. I particularly love how light they are; why, one hardly even feels them when they’re on. I appreciate your dropping in! I like it when you post your jewelry, Debbie. I chuckled at your description of the third one – the blue agate. Is it tasteful to wear five of them on each arm? :) I really like the earrings below that – I love hearts! Janna, your comment made me laugh out loud! I don’t know whether it’s tasteful to wear five of them — on each arm! I suspect fashionistas would call it overkill, but I empathize with the idea. Who doesn’t want to handle rejection better?? I’m glad you liked my jewelry; thanks for visiting.